Reliance Mobile has come up with an exciting offer that brings together all 3G Lovers to test the next generation 3G mobile TV service free of cost. All Reliance 3G users in towns where Reliance Communications (Rcom) has launched its 3G Mobile and Data services can now view Unlimited Live TV services including all available TV channels for FREE. 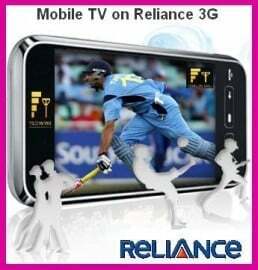 Reliance 3G Mobile TV enables the customers to watch live TV channels on their mobile phones. The customer will have access to 120 channels across genres. Also available is deferred content and video on demand.The service is available through a downloadable client application, as well as through the WAP portal. The client is available for about 85% of the handsets available in the market. To avail the free FREE Live offer, Reliance Mobile users will have to download Mobile TV application by one toll free sms. There is No subscription charges, no data charges to access services with in promotional offer period. To download the Mobile TV app and avail the offer, users have send MTV to 55447 (Toll Free).The start date of the offer is 8th Janurary 2011 and the end date is 31st Janurary 2011. 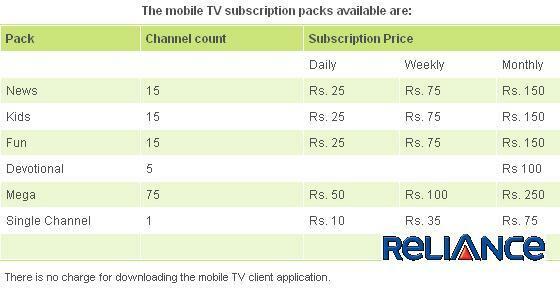 Apart from the FREE offer, 3G Mobile TV Pricing for Reliance is subscription based. Once the customers download the client, they can subscribe to packages or individual channels through the client itself. The subscription packs are available for Daily, Weekly and Monthly Plans for packs and individual channels. There is no separate charge for data used while watching mobile TV, and data usage will not count towards the free quota if the customer is a 3G data plan subscriber.